Nothing can defeat the honesty as it is the human behavior which is loved by every person who doesn’t love listening lies. Of course, no one wants to listen to lies but almost everyone tells lies to others. A person who lies to others can’t be honest with himself also. For leading a successful life, Honesty is most important asset you can have. Honesty is one thing which can help you in connecting to yourself as well as people. The more you be true to yourself and mankind, the more you would gain. It’s a slow fortune game but the richest legacy for sure which can be cherished for lifetime. An Intelligent person never lies to other people because they don’t fear from anyone. Liars need to remember what they say and a wise person will never carry a load of lies on his heart. For living a happy and satisfactory life, the first and foremost thing is that you need to get off the loads and tensions from your life. A fool can never learn that honesty is most important for living life but a wise person will not live his life without honesty. Whether someone loves you being honest or not but it will be best for you if you will remain truthful to every person you talk. Avoiding truth won’t help you with living your life in a stress-free way but lies will only create a burden in your life and that’s why it is better to leave the idea of living a stressful life because one can’t do anything well without having the mind and heart get off from the tension and loads. A lie can never make something better for anyone and it might seem that a lie can save someone from getting punished. 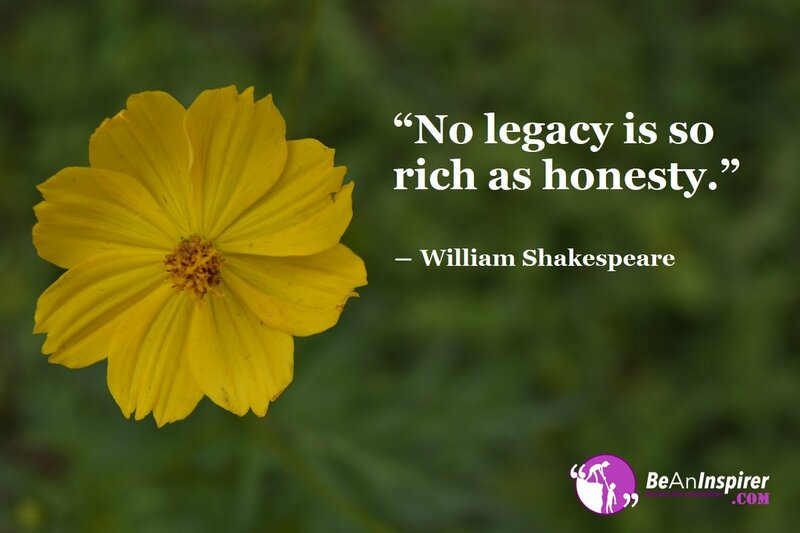 But in long-term the richest legacy of being honest always works. The person who creates mistake will not get chance to regret and this will make him do more mistakes in future. If anyone doesn’t want to live a life of negativity, then holding the hand of honesty is the best way to live a pragmatic life. Nothing can happen to a person who always tells the truth and believes that honesty is most important. Yes it is true that you might need to face struggles when speaking the truth every time but you will sleep without thinking about the lies you told in the day. An honest person is always respected in his all phases of life and that would be the richest legacy he/she can follow. You should remain free of deceit and genuine person. Your outspoken nature might hurt someone who hates truth but you will live a satisfactory life always.